With a blinding light from the sky, came a voice from Heaven, saying, "Saul! Saul! why are you persecuting me?" AUL, THE YOUNG Pharisee, was a Jew. Although his home was in another country, he had come to Jerusalem when a boy to study the Jews' religion, and now he was a very strict Pharisee. He believed in the law of Moses, and he thought the new religion of Jesus would destroy this law which God gave to Moses. Therefore he was angry with the believers in Jesus, and he wished to be rid of them all. The chief priests and scribes were glad to have such an earnest young man as Saul take their part and defend their cause. They gave him permission to treat the disciples shamefully, hoping in this way to discourage others from accepting the new teachings. And so it was that Saul labored night and day working and planning how he might destroy the church in Jerusalem. Saul, the Pharisee, became more angry than ever. "I will stop this crazy religion yet!" he cried; and, rushing to the high priest, he asked permission to go as an officer to a Gentile city called Damascus and search among the Jews there for disciples of Jesus. He planned to kill them or bind them as prisoners and carry them back to Jerusalem. The high priest wrote letters to the rulers of the synagogs in Damascus, telling them about Saul's purpose and commanding them to help Saul find the believers who might be in the city. These letters Saul took, and calling some friends he started at once on the long journey to Damascus. Messengers from Jerusalem had already arrived to warn the disciples in Damascus about Saul's work. They told about his bitter hatred of believers everywhere. And they told also of his soon coming to Damascus with letters from the high priest to the rulers of the synagogs, commanding that every believer in Jesus should be punished or imprisoned. And the believers wondered what they should do, for they feared the wrath of this proud young man. This voice said, "Saul! Saul! why are you persecuting me?" Now Saul was greatly surprised. He had thought he was defending the true religion when he opposed the believers in Jesus. And he cried out, "Who are you, Lord?" 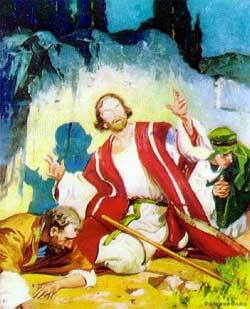 The voice answered, "I am Jesus of Nazareth, whom you are fighting against. It is hard for you to oppose me." Like a flash of lightning Saul remembered how cruelly he had treated men and women who believed in this Jesus. He saw how wicked he had been. Now he cried out, "What shall I do, Lord?" Jesus answered, "Rise up and go into Damascus; there you shall be told what you must do." And sure enough, there was in the city of Damascus a believer named Ananias. This man also had a vision from God. And in the vision he heard God's voice calling, "Ananias!" He answered, "Here I am, Lord,"
The voice said, "Rise up, and go to the street called Straight and ask at the house of Judas for a man called Saul, of Tarsus, the city where he was born, for this man is praying. And he has seen in a vision a man named Ananias coming in and putting his hand on him, that he might receive his sight." These tidings surprised Ananias. He could hardly believe what he heard, for he knew of Saul, the great persecutor of believers everywhere. Now he exclaimed, "Lord, I have heard many things about this man, how much evil he has done to those at Jerusalem who believe in Jesus; and even here he has been given power to make prisoners of all the believers he can find." But God answered, "Go your way as I have commanded; for Saul is a chosen servant of mine to carry my name to the Gentiles and even before kings of the earth, as well as to the Jews. And I will show him how he must suffer great things for my sake." Ananias was no longer afraid to obey, for he believed the words God had spoken to him. So he rose up at once, and went out to search for Saul. And when he found the blind visitor in Judas' home he spoke to him kindly, saying, "Brother Saul, the Lord Jesus, who appeared to you on the road when you were coming to this city, has sent me that you might receive your sight, and receive the Holy Spirit." Then he placed his hands upon Saul, and what seemed to be scales fell from the blinded eyes of the stricken man.